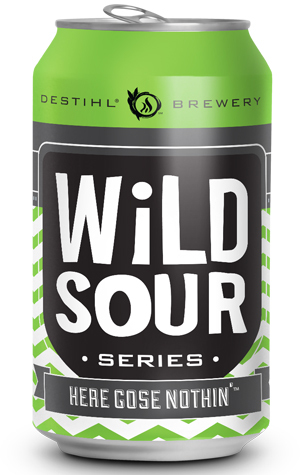 One of four beers from DESTIHL’s Wild Sour Series, Here GOSE Nothin’ is made with Munich malt, wheat, oats, Crystal hops, sea salt and coriander, and it is spontaneously fermented. My vote for best beer name of the year. DESTIHL, well-known for its wild and sour offerings, does not disappoint with this gose. Pouring a slightly hazy golden hue with just a ring of foam, the sour-citrus notes let you know they mean business with first whiff. Lemony tartness and a touch of salinity from the added salt, per the style, are evident upon first sip. (The salt seems to make a bigger presence when you lick your lips!) A mineral quality rounds out this gose and contributes to a dry finish that makes you want to take another sip. The beer pours quietly, deep gold trending toward amber, with almost no foam. The nose is fascinating—it smells sour but not acetic—more reminiscent of a key lime pie with a medicinal twang. The first sip leaves no doubt, hitting the tip of the tongue with full lemonade acidity as a dash of salt brings out a certain type of fullness. The complexity of the nose doesn’t really follow through onto the palate, but I’m not sure it needs to. There’s a lot of beer here, and it’s more chewy than refreshing. It’s a fine-tuned thing as it is, and will work very well with lime-driven Thai dishes.